At the Build Conference this week, Microsoft handed out 5000 pre-configured Samsung tablets which included Windows 8 Developer Preview plus the development tools for building Metro style apps. They also made available an ISO containing the same bits. I suppose in a pinch you could develop apps on an underpowered tablet, but does anyone really want to write code on a tiny screen with an underpowered CPU? 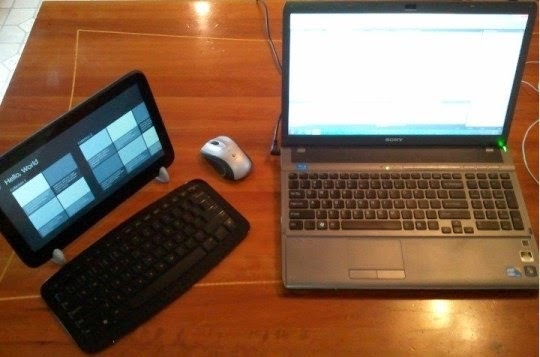 To the left is an ExoPC slate running Windows 8, sitting on some handy tablet stands, with bluetooth keyboard and mouse. On the right is one of my dev machines which has been booted to a VHD image of Windows 8. If you were not lucky enough to go to Build and get one of the Samsung tablets, think about buying a Windows 7 slate. This blog post lists a bunch that have been tested in Microsoft's labs with Windows 8. I would look for something with a min display res of 1366x768, 2GB ram and at least a 32GB SSD. To install Windows 8 on your slate, you can create a bootable USB flash drive and copy the Windows 8 Dev Preview to it. I outlined the steps for the ExoPC slate here, but other slates will be similar and you can search around for blog posts where people have set up their slate for Windows 8. To install Windows 8 on my development machine, I created a bootable VHD by following this great guide here by Mister Goodcat. As far as I know, this is the only way to get the intial release of Visual Studio 11 and Blend 5 for Metro app development. On the Windows 8 slate, there is an included Remote Debugging Monitor - you'll find this under the Metro UI icons next to VS and Blend. Fire that up, because it will tell you if remote debugging is working. Make sure you can Ping your slate on the network from your dev machine. Then on the dev machine, set up the project properties for debugging by entering the slate's network name (see screenshot above). That's it - you should now have a bit more powerful dev environment for playing with the Windows 8 dev tools.